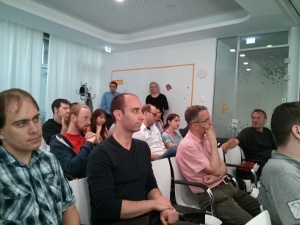 This evening I joined the group over at Immobilienscout 24 for today's Hadoop Get Together. David Obermann had invited Dr. Falk-Florian Henrich from CeleraOne to talk about their real-time analytics on live data streams. Their system is being used by the New York Times Springer's Die Welt for traffic analysis. The goal is to identify recurring users that might be willing to pay for the content they want to read. The trade-off here is to keep readers interested long enough to make them pay in the end, instead of scaring them away with a restrictive pay wall which would immediately lead to way less ad revenues. Currently CeleraOne's system is based on a combination of MongoDB for persistent storage, ZeroMQ for communicating with the revenue engine and http/json for connecting to the controlling web frontend. The live traffic analysis is all done in RAM, while long term storage ends up in MongoDB. 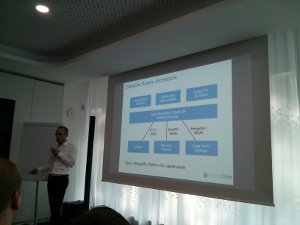 The second speaker was Michael Hausenblas from MapR. He spends most of his time contributing to Apache Drill - an open source implementation of Google's Dremel. Being an Apache project Drill is developed in an open, meritocratic way - contributors come from various different backgrounds. Currently Drill is in its early stages of development: They have a logical plan, a reference interpreter, a basic SQL parser. There is a demo application. As data backends they support HBase. For most of the implementation they are trying to re-use existing libraries, e.g. for the columnar storage Drill is looking into either using Twitter's Parquet or Hive ORC file format. In terms of contributing to the project: There is no need to be a rockstar programmer to make valuable contributions to Apache Drill: Use cases, documentation, test data are all valuable and appreciated by the project. If you missed today's event make sure to get enlisted in the Hadoop Get Together Xing Group so next time you get a notification. One thing to note though: When registering for the event - please make sure to free your ticket if you cannot make it. I had a few requests from people who would have loved to attend today who didn't get a ticket but would most likely have fit into the room.